Part of Hitler’s Atlantic Wall, the battery at Longues Sur Mer was completed in April 1944. Consisting of four 150mm navy guns, this battery posed a real threat to the ships taking part in the D-Day landings on June 6th 1944. 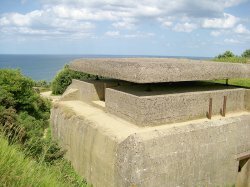 The German’s created this battery to cover what would eventually be Omaha and Gold beaches; the code names given by the allies for two of the beaches used for the invasion of Normandy. Each of the four navy guns were protected by huge concrete casemates. 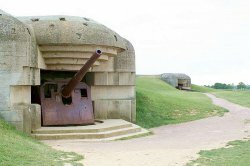 The site of the battery also included a command post, several defensive machine gun posts and accommodation for the soldiers. The night before and on D-Day itself, this battery was subjected to heavy air and naval bombardments. Three of the four guns were silenced on June 6th; however, one remained firing until late into the evening, being captured the following day by the 231st Infantry Brigade. All these years later, Longues Sur Mer is still an impressive sight. Some of the casemates still house the guns used by the Germans on D-Day. Evidence from the air and naval bombardments is everywhere to be seen; the casemates showing signs of the attack they sustained on D-Day. Taking a wander down towards the cliff edge, there are numerous machine gun emplacements and ammunition stores still intact. At the cliff edge itself, there is the fire control bunker; this would relay the co-ordinates of enemy positions back to the gun emplacements. It is possible to climb into this bunker and look across the English Channel; trying to imagine what the scene must have been like in 1944. To the right of the fire control bunker, you can see the remnants of the Mulberry Harbour built by the allies at Arromanches. Behind the location of the gun casements, the allies created a temporary airfield shortly after D-Day. 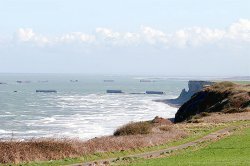 Although there is no sign of this today, the surrounding fields, stunning sea views and the remnants of this historic piece of the Atlantic Wall, make this a fantastic location to visit.